Tyler Winklevoss calls out Bill Gates - Put your Money where your mouth is. Tyler Winklevoss strikes a hard counter at establishment billionaires and their critiques of Bitcoin and other cryptocurrencies. If you really believe what you say then prove it. A variety of billionaire including Charlie Munger and now Bill Gates have come out against Bitcoin. If you think they will fail........Then short them. If you think they are a fraud........Then Short them. If you think they are stupid.....Then short them. Winklevoss makes a strong point though, talk is cheap lets see action. Personally I believe they would never do this with their own money. If they have used any time researching it they would know they are going against tidal wave. But hey I could be wrong. Shorting any asset is risky. While going long on an asset an investors losses are limited to the purchase price of an asset, the potential losses of shorting are unlimited. Shorting an asset like Bitcoin that has a deflationary limited supply attributes is even more dangerous. If any of the bullish projections pointing toward a price per bitcoin of a million dollars per were to come out while an investor shorted the losses would be staggering. However, Bill Gates could afford this risk. As Tyler Winklevoss explains the market and instruments that can be used for Bitcoin continue to expand each day and yes you can now short Bitcoins. There are future contracts in XBT on the Chicago Board Trade in which you can take a short position just like other assets. This process is thus similar to shorting pork bellies or crude oil. Do I recommend shorting Bitcoin........heck no. I was reading Charlie Munger's critiques yesterday. For the record I love Charlie and have actually spent multiple months analyzing Warren Buffet's Annual Letters just to glean out tidbits from Warren and Charlie. There is actually a book now that put the letters together called "The Essays of Warren Buffet" by Lawrence Cunningham. I would highly recommend it. (Yes I know Charlie Munger and Warren Buffet are not the same person). So I am by no means a Charlie hater. Also I am not a person that advocates putting all of your money into cryptocurrency. I do think though that critiques like Charlie's yesterday go way too far and are based on some failed assumptions. His complement Bitcoin is a techy computer whiz bang gadget is often something people say who don't really understand it. It is the canary in the coal mine I look for when valuing someone's critique. I want to say first off that anyone who wants to invest in anything at all should read, listen and study Charlie Munger and his pal Warren Buffet. Certainly, when they make comments about cryptocurrency you should be there and listening if that is a space you are listening in. However, in this case I really found his critique hyperbolic and wanting. Alright I have a problem with some Bitcoin Critiques. Its not that they are being critical of it, its that their critique reveals their ignorance. I like critism if it makes me ponder and think but Charlie's did not rise to that level for me. The first thing I would say is that Bitcoin is more than a gadety tech thing. Bitcoin is less a technological achievement as it is an achievement in philosophy that technology simply made possible. Tech gadgets come and ago but philosophies like other ideas are virulent, powerful, and immortal. Bitcoin is less a technology than it is an idea. 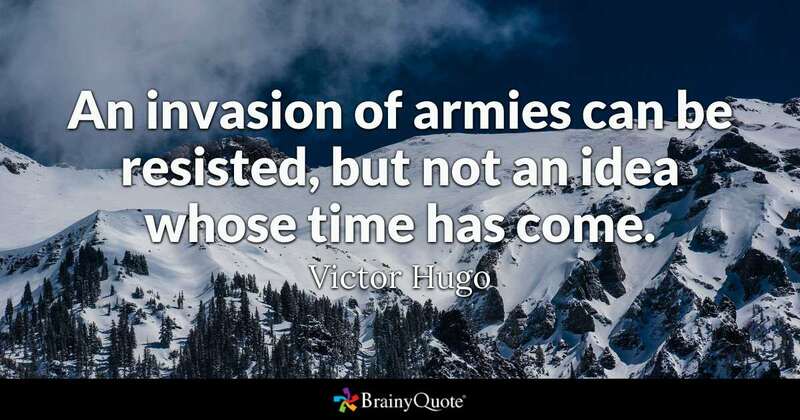 A Quick Tangential note to my already tangential note --- While Victor Hugo was an ardent monarchist initially toward the end of his life he became a stronger supporter of the ideas of Republicanism in which the people hold sovereignty through representatives in a republic. He would certainly be on the list of great minds of the past I would love to talk about cryptocurrency with. Doc Brown get that time machine working already! Arianna Simpson made the point that both Warren and Charile are not strong tech investors. This is true. The sad thing about it is that Bitcoin is explained as a tech thing, and that limits it (At least for now). Bitcoin is an evolution of thought on freedom, what does it mean to be free, and how can people be more free. Why should we the people trust our wealth to governments when we can be better stewards of it ourselves. Bitcoin has flaws, but until you understand what it actuall is your critiques will fall flat because its apparent you do not understand what you are dealing with. Once more what I get out of critiques like Charlie is the immense amount of room for cryptocurrency to grow once it is explained not by techy geeks, but by artists, poets, historians and writers. That is when the idea of Bitcoin will really take off, and contrary to Charlie and Bill I do not believe that revolution has even started yet. My advice to them though is to look at it through the lens of an idea before you short it. That is when you go down the rabbit hole and begin to see things through the looking glass.